A Spinning Baby- HB Story! I was due with my second baby on October 3, 2011. 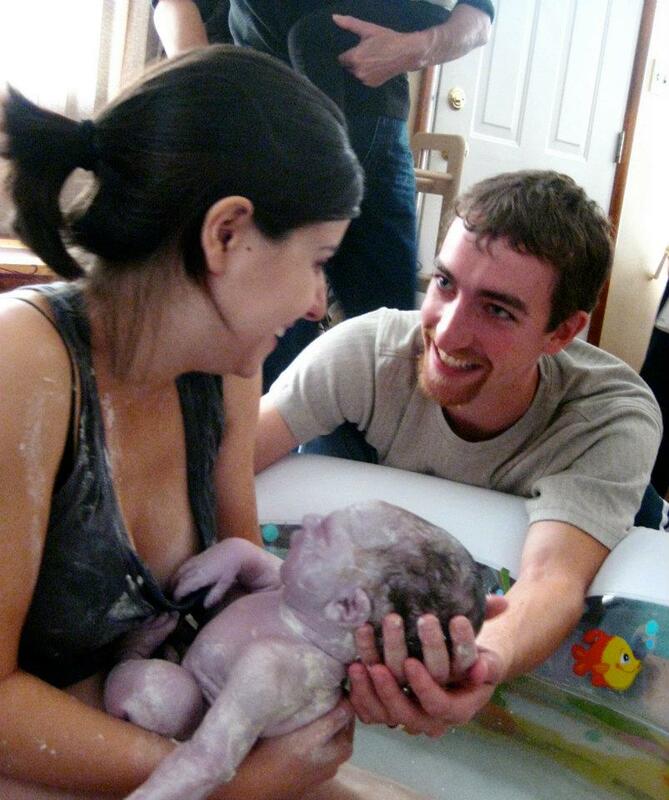 Labor actually began at 41.5 weeks on Thursday, October 13, 2011. Here is the story of how my little son came into the world. Since my first baby came three weeks early, I had a hopeful expectation to have the same experience the second time around. But after my two sisters-in-law had their babies within a week of each other, and my due date came and went with ease, I finally accepted that I was "late". If it wasn't for my best friend's wedding approaching in less than 10 days (in which I was a bridesmaid! ), I might have been okay with being past due. Physically, I felt fine. But emotionally, I really needed and wanted the baby to come! I decided to try natural things to help bring on labor. None of them worked. So after a day of running up and down the stairs, purposely hopping around the house instead of walking (something my little toddler found hilarious), and ingesting far too much evening primrose oil, I went to bed. While hopeful, I also knew the next day could be like every other as well. I woke at 5am to go to the bathroom and felt my first contraction starting. My body and mind instantly became alert and excited! I was in labor! Two seconds later I was harshly reminded of how much these things could hurt. I began the deep hypnobreathing I'd been practicing this whole pregnancy, and got through the first contraction of the day. I laid in bed for 40 minutes, timing the surges at 8 minutes apart. I was going to let Ian sleep as long as possible, but during one of the contractions I reached over and grabbed his arm. I said, "Are you awake?" "Yeah, what's up?" I waited till the contraction passed and replied, "I'm in labor." He woke up immediately and snuggled with me. We had been waiting for this for weeks, and I could tell how excited he was too. 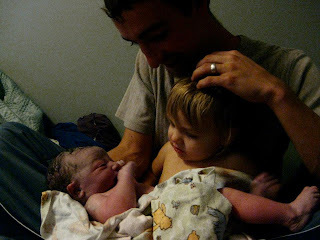 At 6:00, in between surges, I called our midwife to tell her what was going on. She responded with, "Yay, that's great news!" Because she lives 1.5 hours away, she decided to head into our area and simply be close by in case I needed her. She said she'd call me in two hours to see how everything was going. I was totally comfortable with that. I knew I had a long way to go. Usually our little toddler wakes up around 6:20 every day, so Ian and I stayed in our bedroom together, talking and just being excited. Every 8 minutes, I would close my eyes to signal the contraction coming on, and Ian would either hold me or lightly run his fingers along my arms. In hypnobirthing, this "light touch massage" is done to counteract the pain one feels during a contraction. The body's endorphins help block the pain. While the massage didn't eliminate all the pain, it helped so much and reminded me to relax my body. At 7:00, Malley woke up, and my sister was starting to get ready for work. We told her I was in labor, and she came in the room with a huge smile and gave me a big hug. It was so nice that everyone was excited and ready! She decided to work from home that day, and we began doing little things to set up for the birth. We all ate breakfast, then Ian blew up the birth pool. We put a waterproof cover under the Egyptian cotton sheets of our bed and collected extra towels for the "birth supply box." I called Ian every time I felt a contraction coming, and he was right by my side. They were already pretty rough, and after one of them I said to him, "This is going to be a really long day." But Ian was incredible; he helped me get through them all. I'll admit, I took a few moments to comb my hair, put on some make-up, brush my teeth, and pick out a fresh outfit. I would find that these things didn't matter within a couple hours, but I was still pumped at this time. At 8:00, I texted Jen that my contractions had been all over the place - 5 within 20 minutes, but then nothing during the next 20. She said she would go do a home visit with another momma, and then check back with me. Sounds good, I thought. Around this time, I called my parents' house to tell my Mom. She was out at morning Mass, but my Dad told me to text her anyways. I told her I was in labor and to give us a call when Mass was done. Marie prepared two homeopathic remedies for me to sip as frequently as I wanted. One was Mag Phos. 6x in warm water, which would help with the contractions and anything uterus-related. The other was Arnica 200c to help with the overall process of labor, delivery, and beyond. She also kept Malley busy all morning long. It worked out well because Ian was able to be right by my side with no distractions. He and I talked and just hung out in between contractions, and then we would focus during them. I actually found that standing up was one of the best ways to get through them. Ian would stand behind me, lightly massaging my back. And then it would be over. The contractions were about 7 mins apart at that point. Ian asked me, "So, do you think this baby will come before or after noon?" If I was a mean person, I would have laughed out loud. Instead I just said, "Oh darling, we will be at this all day." I was judging this based off my first birth, which was 8 hours and started abruptly with intense contractions at 4 mins apart. In my mind, I knew I still had to get to that point, and then ALL the way to birth. Off and on, I listened to a few minutes of a guided relaxation on my iPod. I layed down on the couch and tried to relax completely. But then a crazy contraction came, and as hard as I tried to breathe and get through it, I ended up ripping my ear phones out and sitting up, nearly losing it. Even though I should have deducted it to laying down (because laying down was the worst thing for me during Malley's labor), I'll admit, I panicked a little and told Ian we had to call Jen. After that, I was able to keep my wits about me. I took bathroom breaks and frequent sips of the remedies. Around 10:00, Jen arrived. Things were good at that point. We all talked and touched bases, and she reviewed my birth plan while we sat around the dining room table. Ian had to step out for a few minutes, and I felt a wild sort of fear without him when a contraction came on. But Jen was right there and guided me so well through it. She knew just what to say to get me back on top of it. It was comforting that I had all this help just for me! Around this time, I went in the bathroom and lost a ton of mucus. There's my plug, I thought to myself. I was a little bummed that I only had dilated enough to lose it just now, but later Jen told me that's probably not how it really works. But at the time, that's what I thought. As with the first birth, we did no cervix checks to see how far along I was. I really like doing this because I wasn't worried about numbers, and it was relaxing for me to not know. Jen stepped outside to make some phone calls and throw the ball for Kila (our puppy), so I got in the birth pool and listened to a relaxation on the earphones. Ian was right behind me, giving me an awesome neck and shoulder massage the whole time. It was a great half hour. The house was so quiet, the water was soothing and warm, and for the first time ever I was in a "zone". I felt the contractions, and they were still poopy, but being so relaxed in a rhythm of deep breathing made them very manageable. Jen came by the pool to give the baby's heartbeat another listen. Everything sounded great. She then told me that Heather, her assistant who attended Malley's birth, wouldn't be able to make it. She was in between night shifts and just couldn't swing it. I was understanding but sad too. We had a backup, who I had met and really liked, so Jen told me we'd call her in a little while. After my mom arrived, and I'd given her a smile before closing my eyes again, the water seemed to be cooling down. Since I bled a lot after my first birth, we had decided to keep the water temperature less steamy this time around. But the cool air above the warm water was making me shiver, and I could no longer focus. Ian helped me out and I put on new clothes. I was freezing, though, so my mom wrapped a huge blanket around me, which helped so much. My contractions were about 5 minutes apart. Around then, Malley woke up - not only to her Grandma - but to a huge pool of water in her dining room. The excitement was adorable. She stuck with my mom from then on. They went outside, played with blocks, read books, and had snacks together. It was great; Ian and I were able to stay focused together. Before the birth, I thought that maybe help wouldn't be necessary for Malley. Maybe she'd be fine and we could keep her busy. But everything about having the help there made the whole experience a billion times better. It was probably around 12noon then. Even though I was pretty tired at that point, I wanted to stand up for two reasons: 1) I was able to handle the surges much easier, and 2) they started coming a bit more frequently when I was standing. Good good. Let's get this going. After listening to the heartbeat again, Jen asked if I felt any baby movement. I said yes, and explained where...and also added that I had back pain during the contractions. She asked if I could lay down so she could determine the position of the baby. I agreed but warned her that it might get bad. While I was laying on the couch, she felt around and noticed that the baby was leaning toward the right - and began to say something when a bad contraction came on. I felt myself losing it and told her I had to stand up right away. She and Ian helped me get through it, but it was intense. Thankful it was over, I resumed my "good" position of standing up, and Jen hopped on the computer to look up some tips on spinningbabies.com. Just the other night, she had read about a way to help the baby angle down better. She showed Ian and I what to do. Pretty much, you lock your fingers under the belly and lift up at the start of a contraction. This extra lift helps the baby descend easier. When the next contraction started, we tried it together, but probably too enthusiastically - because it made the surge 10x worse. Jen said we didn't have to do it anymore if it was bad. But little did they know, I modified it myself by just doing it very, very slightly during each following contraction - which, by the way, were coming very frequently. I'd gently lift my belly when one began and could not believe what I felt: the baby was moving down! I could actually feel the descent. It was incredible. But not fun either. It got to the point where I couldn't be silent anymore. The contractions were so strong and intense that I had to make some noise. Sometimes I'd say "Ow, ow, ow!" or kind of cry. Poor Malley must have been a little upset by this because I could hear my mom gently telling her I was okay, and that I was just using my voice to help the baby come out. She later told me this helped Malley accept what was going on, and they went back to playing with some toys. During one contraction, I felt something crazy. Kind of confused, I said, "I think I might need to push..." Jen and Ian both were like, "That's okay." But I looked at the clock and dismissed this crazy idea. It was only 1:00. It just wasn't time yet. But the next contraction came, and oh my gosh, I really needed to push. Jen had already started to fill up the pool again with warmer water before I said this, so the timing was perfect. I got in and sat on my knees. I asked my Mom to call Marie from downstairs and looked at Ian with more excitement than I can explain. I started to cry with complete happiness and said, "Oh my gosh, the baby's coming!" There was a slight pause in everything - maybe a minute or two of no contractions or anything. Then I could feel one coming...and I was pushing! The next 10 minutes flew by. I did my best to relax all my muscles and let my body work with each surge. I felt a ton of pressure down there, and as I reached down to see what was going on, my fingers hit a bulge. Instantly, my water broke and hot fluid flooded around my feet. It was pretty cool, considering I have no recollection of my water breaking the first time around. With the amniotic fluid out of the way, I could feel the baby's head coming as crowning began! I made Ian check it out too. It was really incredible. Then the intense ring of fire started. I remember saying, "Oh my gosh, the head! But ouch this really hurts." I was so eager that Jen reminded me to wait for the next contraction. After a couple I couldn't help laughing with tears in my eyes - this was really happening! A few pushes later, the head was out! Ian and I could feel the little face and all the features. At this point, I was just dying to see him/her, so I said, "Come on, baby!" And then, during the next push, the entire body came right out into my hands. Jen slipped the cord out from around the neck, and I lifted the baby out of the water and into my arms - but not before looking to see the big surprise: boy or girl? "It's a boy!" I exclaimed. It was such a happy announcement! We had waited till the end for this pregnancy, and everyone had been telling me the whole time, "You're having a boy." I myself would have been surprised if the baby ended up being a girl - but I wouldn't exactly say I knew it was a boy. It was just awesome finally knowing for sure! And there he was...right in front of us! He was completely covered in slippery vernix. I cradled him against my chest and kissed him, but Jen noticed I might have been pressing on the cord. So I laid him back in the water and gently roused him to make some noise. Jen told us not to worry because he was still getting oxygen from his cord. We touched his face and rubbed his belly until he made a sweet little cry. It was just perfect. There were a few minutes of awesome bliss. Ian and I were the only hands that touched him for a long while, and Malley came in the pool to check out this wiggly, white thing in mommy's arms. She wasn't too sure about it all, but a popsicle took care of everything. She was happily running around in no time. After the cord stopped pulsating, Jen clamped and Ian cut it. Some rolling contractions came back, and they were quite uncomfortable. So Ian bundled our little son in a blanket and held him while the placenta was birthed. After that, Amanda, the assistant arrived. It was so sweet how quietly and respectfully she came in the front door and gently set her bags down - and then she noticed the baby and exclaimed, "Oh my goodness - congratulations!" Together, Jen and Amanda helped me into the bedroom where I was able to relax and hold the baby. But I was shivering and shaking like crazy. They said my body was probably just in a little bit of shock from the birth, but mentally I was completely fine. My mom gave me some more arnica and warm blankets, and in no time the shaking had gone away. I hadn't torn or anything, and the bleeding was all normal. So after making sure I was okay, everyone actually left the room and gave Ian, Malley, and I some alone time with the baby. Everyone was awesome. They cleaned out the pool, did some paperwork, brought me chocolate milk, and called the relatives while we enjoyed some family time. Malley held her little brother and gave him lots of kisses right away. He made funny, sweet little noises and was so alert with us. I loved this birth story. This is exactly how I want my birth to go ;) Everything just was so beautiful and peaceful and I just kept thinking "THIS. This is what I want!!" 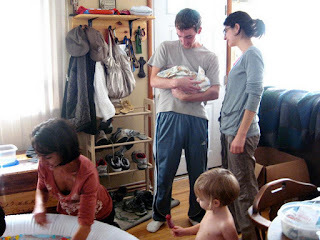 It made me even more excited for my April 2012 homebirth. Thank you so much for sharing. Love this! I agree with Lacey too, I have #2 coming in February 2012 and this is pretty much how I see it going! And funnily enough October 13 is my toddler's birthday, lol. Congrats to her and her family, what a beautiful story! Beautifully written, it brought tears of joy to my eyes, lol! Well done on bringing your precious son into the world in such a delightful way! I am really pleased to say that I learned something new too! My last baby was not well positioned and it was my longest labour ever! I shall try the lifting technique next time if I suspect that might be happening again.